In the past 12 months Nikon has released seven D-SLRs. Five of them have housed full-frame sensors. What used to be the sole territory of the professional has become accessible to photographers with more modest ambitions. The latest offering – the D750 – perhaps provides the most tempting option for enthusiasts wanting to take the step up to the full frame format. Although it sits above the D610 in the line-up – and below the D810 – it houses a number of features found on more enthusiast models, such as a flip-out screen and built-in Wi-Fi. It also shares some specs with Nikon’s flagship D-SLR – the D4s, so we got our hands on one to find out what this new model offers. At the heart of the Nikon D750 lies a newly-developed 24.3Mp full-frame sensor. It matches the D610 for pixel count, offering images that measure 6016x4016px. Unlike the recently-released D810, this camera features an anti-aliasing filter as part of the sensor, which is designed to reduce the effects of moiré (repeating patterns) on images. The sensor is paired with the EXPEED 4 image processor the same engine that powers Nikon’s top-of-the-range D4S. This combination of chip and processor means the D750 can shoot at a speedy 6.5fps, making it the second fastest in the entire Nikon D-SLR family. It’s beaten for pace only by the pro-level D4S, but you’d expect it to lose out to a model which costs almost three times the price. The sensor and processor partnership goes on to deliver some promising specs. It has an ISO range of 100-12,800 (expandable to 50-51,200) and has a better low-light performance than the high resolution D810. Fewer pixels crammed onto the sensor means each individual photosite has a greater light-gathering potential. In turn this gives the sensor a better performance in dim conditions, so there’s not as much grain (digital Noise) on images captured at higher ISOs. The D750 features the Multi-CAM 3500FX 51-point AF system, which uses 15 cross-type sensors in the centre. This can be configured in 9-point, 21-point, and 51-point coverage settings and is sensitive down to -3 EV. It’s the same AF system as Nikon’s top-flight D-SLR, and also features Group Area AF which makes it easier to lock on to and track smaller subjects against distracting backgrounds. This release is the first full-frame D-SLR to feature a tilt-screen monitor. The screen can be pulled out from the body and tilted up 90º and down 75º. This has great advantages when trying to compose from an awkward or unusual angle, so it’s easy to get more creative with your compositions. 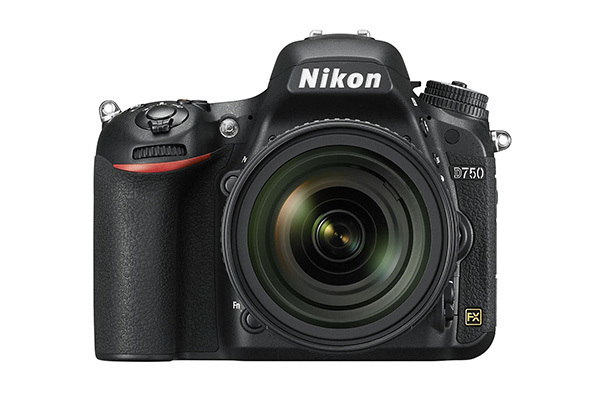 The D750 is also the first full-frame Nikon model to feature built-in Wi-Fi. You can upload images straight to your smartphone or tablet, making it simple to share shots on the move. The Wi-Fi also connects to an app so you can remotely control the camera. The D750 includes seven special effects settings, such as Colour Sketch or Miniature Effect. This is a fun way to get creative in-camera, and should appeal to enthusiasts more than the pro end of the market. All of this technology is housed within a weather-sealed body. It’s smaller and lighter than its immediate Nikon siblings, partly due to its shell’s monocoque (one-piece) design. In the hand the D750 is as sturdy as they come. A large, well-sculpted grip and textured rubberised surface provide a superb hold, and the 840g weight is reassuring, not cumbersome. For the most part, the buttons and controls are intuitively laid out. However it’s not possible to adjust the ISO in Manual mode without changing your hand position, which may be a little frustrating if you’re working fast. There’s a mode dial on the top left, which gives access to the usual M,A,S,P modes as well as Auto, Scene and Effects settings, and this is locked via a central pin. The viewfinder is good-sized, bright and offers 100% coverage. There’s a grid overlay to help with framing and shooting information is displayed on the periphery. What sets this camera apart from its rivals is the tilt screen, and it really does open up new creative opportunities – allowing you to accurately compose from high or low. It can’t be rotated all the way around though, so you can’t use it for selfies. There are four display options available to toggle through, like a 3D horizon and a composition grid. The built-in VRII (Vibration Reduction) from the bundled 24-85mm f/3.5-4.5 AF-S G ED VR lens makes it possible to shoot sharp pics at slower shutter speeds up to four stops slower than usual. Focusing was fast, accurate and discrete thanks to the Silent Wave Motor found in the lens. The Group Area AF worked well, and locked on to small subjects with ease. Although there are 51 AF points available, they can only be configured relatively centrally, and don’t extend to the frame edge. The EXPEED 4 image processor impressed during our tests. When set to capture RAWs, the D750 could fire off a high speed burst of 15 pics before the buffer stalled. These took 5.6secs to be recorded to our 100MB/s PNY SDHC card. A single RAW took 0.9sec to be saved. With JPEGs, we rattled off 72 shots before the processor needed a rest, and these pics took 5.5secs to be written. Firing a single JPEG image, the D750 managed to save the file to our test card in just 0.5sec. The D750 will currently set you back £2249 when bundled with the 24-85mm lens, or £1799 for the body. This places it between its two full-frame siblings – the D610 (£1330) and the D810 (£2599). Although it offers the same resolution as the D610, this camera features a more advanced processor which makes it faster, an improved AF system, as well as the tilt screen and built-in Wi-Fi. It’s also capable of rivalling the very best cameras in terms of ISO and low light performance. With regard to alternatives, the Canon EOS 6D is a 20.2Mp full frame D-SLR and costs £1299. It also features Wi-Fi, but doesn’t have a tilt screen and only sports 11 AF points. The Sony A99 is the same price as the D750 and has a 24.3Mp full frame chip, shoots at 6fps and has 102 AF points. There’s plenty of choice in the full frame market but if you’re stepping up from an APS-C model, the D750 is a tempting option. If you’re shooting with an APS-C camera, and rely on features like a tilt screen and Effects modes, but want the benefits of a full frame sensor, then the D750 could be your ideal camera. It bridges the gap between enthusiast models and advanced D-SLRs, making it a great option for those not wanting the 36Mp resolution of the D810. If you’re already a full-frame shooter, then the temptation of a tilt screen may be too much to resist! This review was first published in the December 2014 issue of Digital Photo - download back issues here.